this odd little town when it occasionally vanishes has never been fully determined. So here's a version you can assemble and locate wherever you wish. signs are included so you can design your own haunted little Main Street. 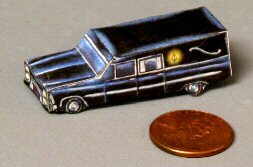 There's even a miniature hearse in case you need to make a quick exit.